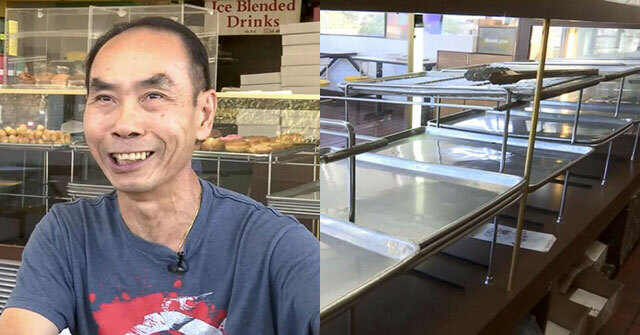 John Chhan and his wife, Stella, used to sell doughnuts every day for nearly 30 years out of their shop, Donut City, in Seal Beach. But that changed after Stella Chhan suffered a brain aneurysm in September, and was placed in a nursing home. Soon after, customers began to notice that Stella Chhan wasn’t selling doughnuts with her husband anymore. But after hearing about her illness, the community initially offered to set up a GoFundMe account for the couple, but John declined the offer saying he simply wants to spend more time with his wife. So, customers have endeavored to help Donut City sell out early every day so he can return to the rehabilitation center where she is recovering. business picked up, and the store began selling doughnuts at a much faster pace as customers pitched in to help John Chhan close early so that he could go visit his wife. Beloved school custodian gets surprise for National Custodial Workers Day that moves him to tears.